Visiting Lacombe restaurants is one of my new favourite things. You have likely figured that out if you follow me on Instagram. I post a lot of pictures of the yummy food I’ve experienced. Owning a lake property in Central Alberta opened my eyes to all the fun that could be had outside of Calgary. Moving to live there full-time last summer opened them even more. Before, we went to town rarely. We ate at the lake eating groceries we brought with us from Calgary. Now, I go into Lacombe at least once a week with extra pop-ins for lunch or dinner. 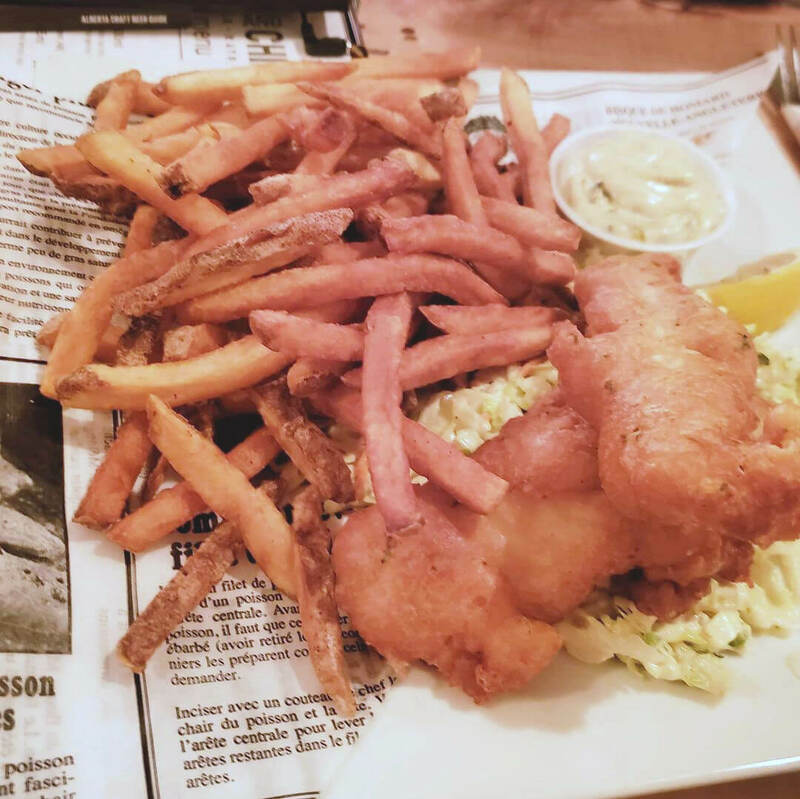 Small towns are not exactly known for great eats but Lacombe is a bit of an exception. 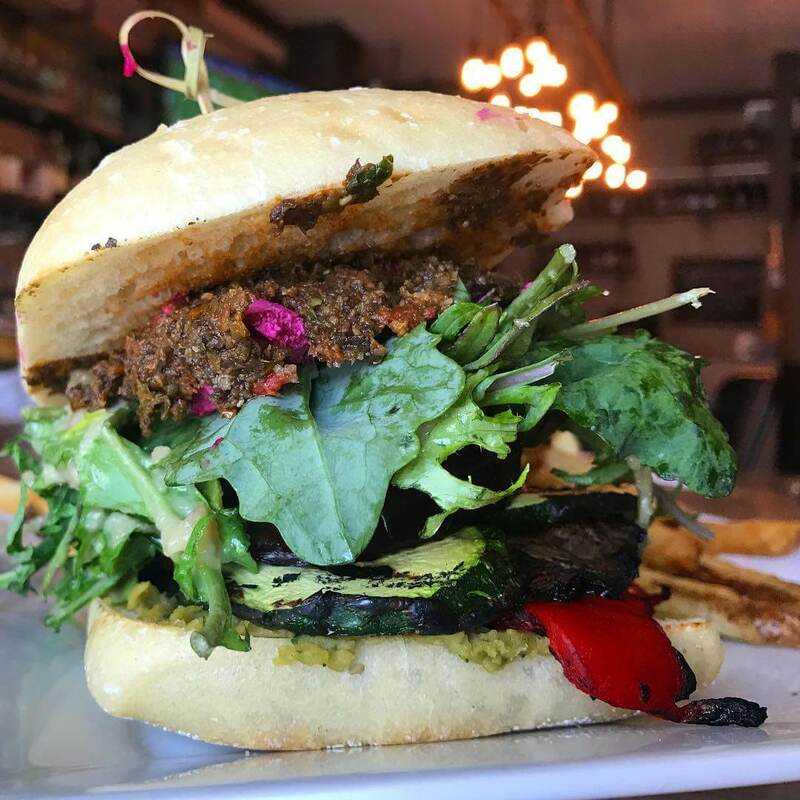 A few passionate restauranteurs are working to bring delicious, interesting food to their home town. I will continue to add new restaurants as I try them. Know one I should try? Let me know! Also, this post is not sponsored at all. I pay for my food at these places just like everyone else. Cilantro and Chive started out in Ponoka as a catering company back in 2009. Owners Riley and Kim Kay decided to make the move to Lacombe in 2015 and have never looked back. 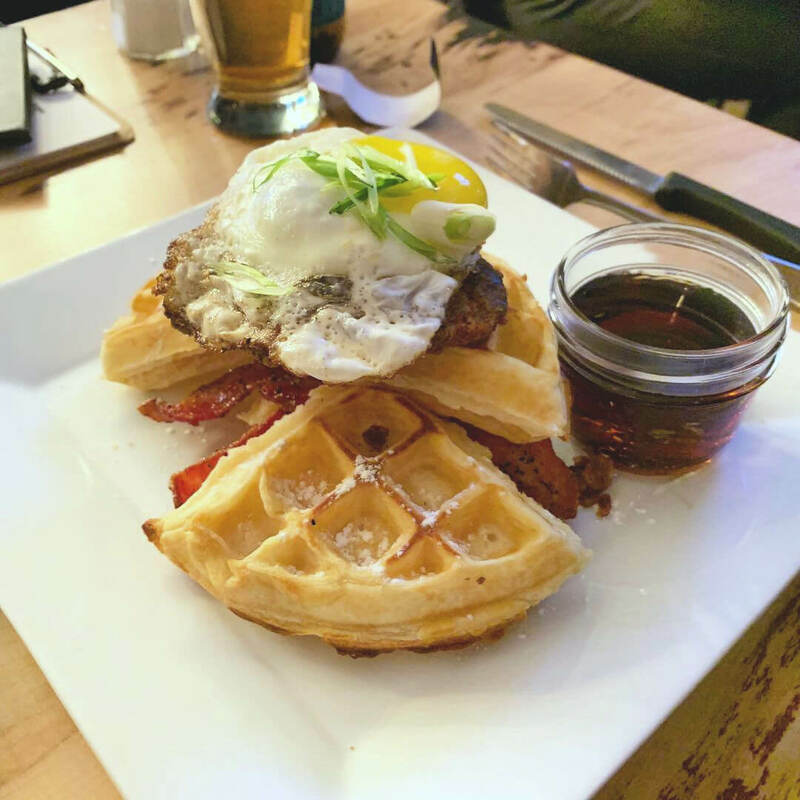 They are now known for their delicious food, extensive local beer selection, and creative cocktails. Oh, and they are super kid-friendly. Evan loves the cheesy noodles on their kid’s menu (he even says it is better than my baked mac and cheese…rude). Plus they have a selection of board games and cards that you can enjoy while waiting for your food. Dewey can’t say no to Chicken and Waffles. This is version 2.0 and it is even better than the original. When he isn’t eating the cheesy noodles, Evan likes to order the fish and chips with one piece of fish. I always order my fries extra crispy. They are delicious and made with locally grown potatoes! Plus they have delicious options for vegetarians like this Loaded Mediterranean Sandwich complete with beet goat cheese! 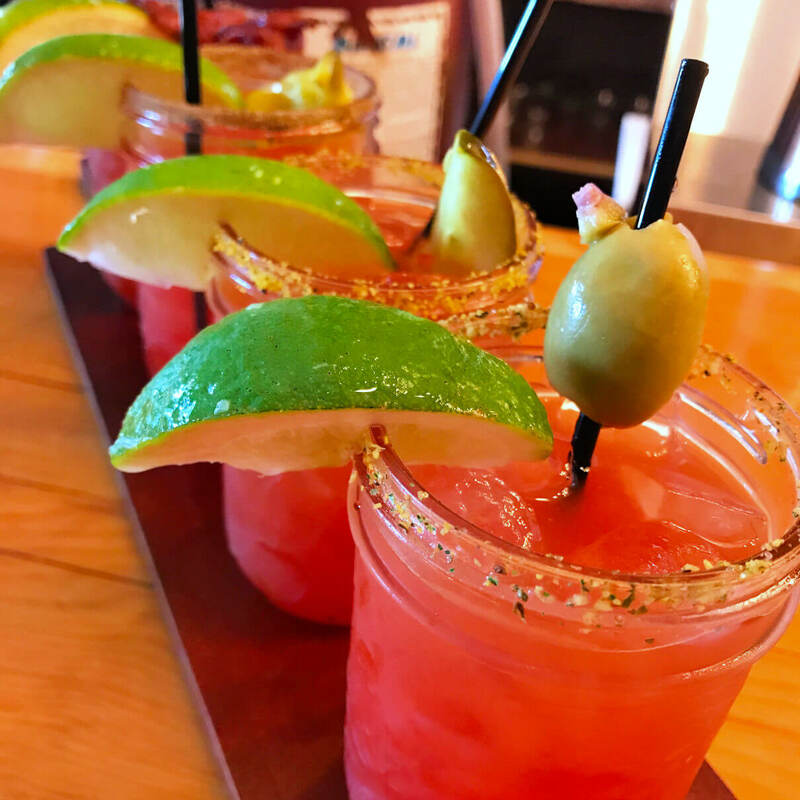 Also they have CAESAR FLIGHTS! Cilantro and Chive is open 7 days a week for lunch and dinner with brunch service on Saturday and Sunday. Definitely, follow them on social media because they have daily and weekly specials that they announce online. When I head into town for groceries, I often reward myself with lunch in town. One of my favourite spots for lunch is Eastside Eatery. Another locally owned gem, they serve the best soup and sandwiches I’ve ever had. 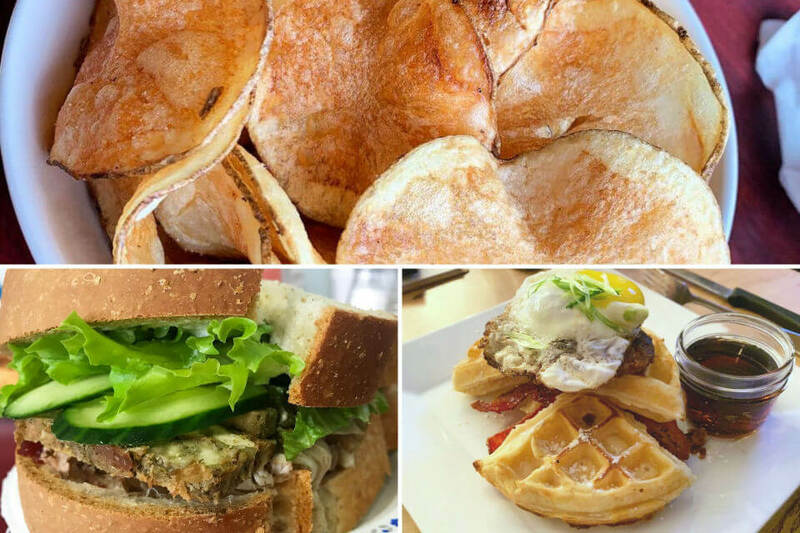 Their sandwiches are overstuffed and served on thick-cut, fresh bread. Soups are made in house and they announce their soup selection for the week on their Facebook page. They have one creamy soup and one broth-based soup daily. Oh and make sure to save room because they make amazing cheesecakes, desserts, and squares too. Make sure you plan to swing by during lunch or breakfast. Eastside Eatery is open Monday – Friday from 8 am – 3 pm. 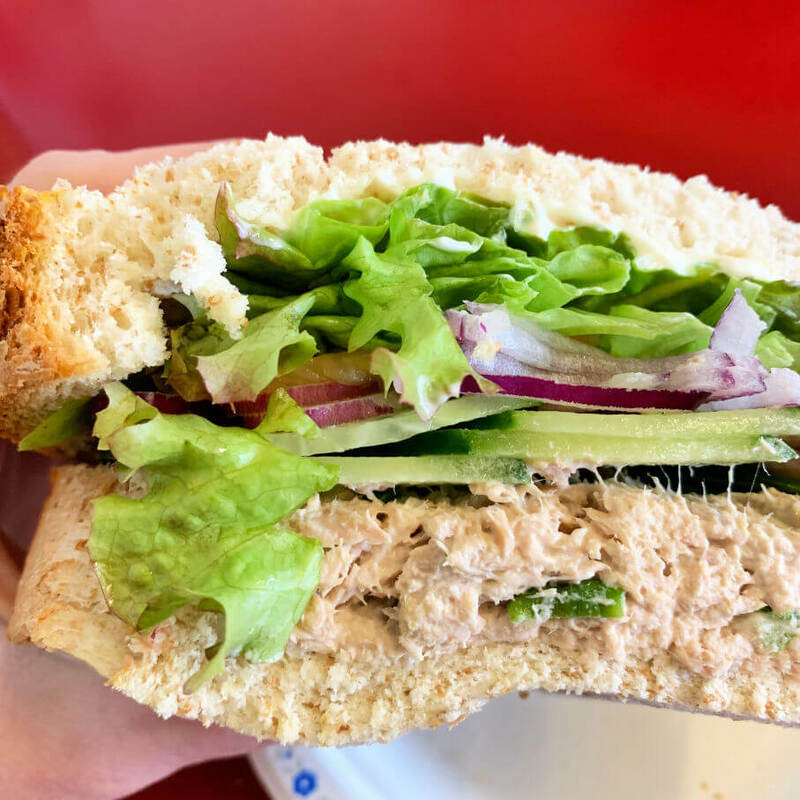 Lately, my favourite sandwich is tuna salad on whole wheat with lettuce, onions, cucumbers and banana peppers. YUM! 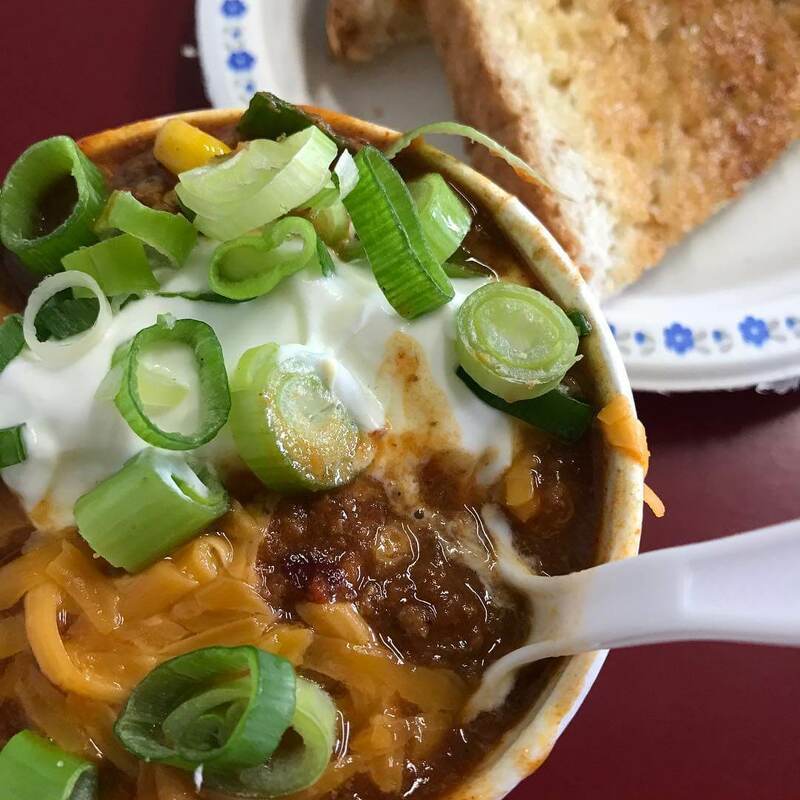 Their chili is filling, delicious and comes topped with cheese, sour cream and green onions. All their soups come in 3 size options so they are perfect for any appetite. 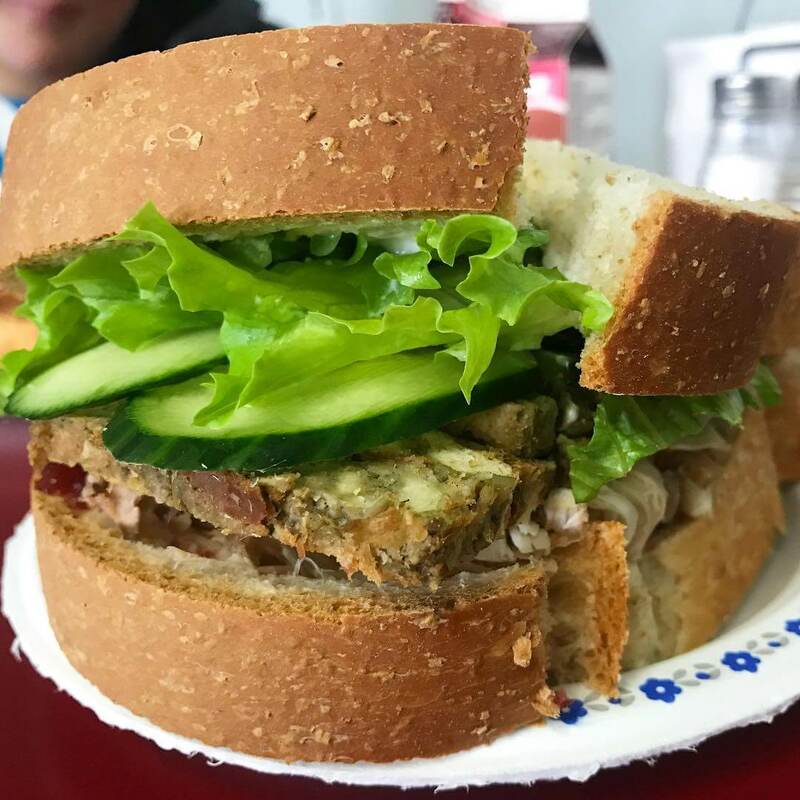 Eastside Eateries signature sandwich is The Gobbler. Shredded roasted turkey, cranberries and STUFFING. So good but you better come HUNGRY! Did I mention that Eastside Eatery also has amazing desserts? Yep. That includes these massive cinnamon rolls. 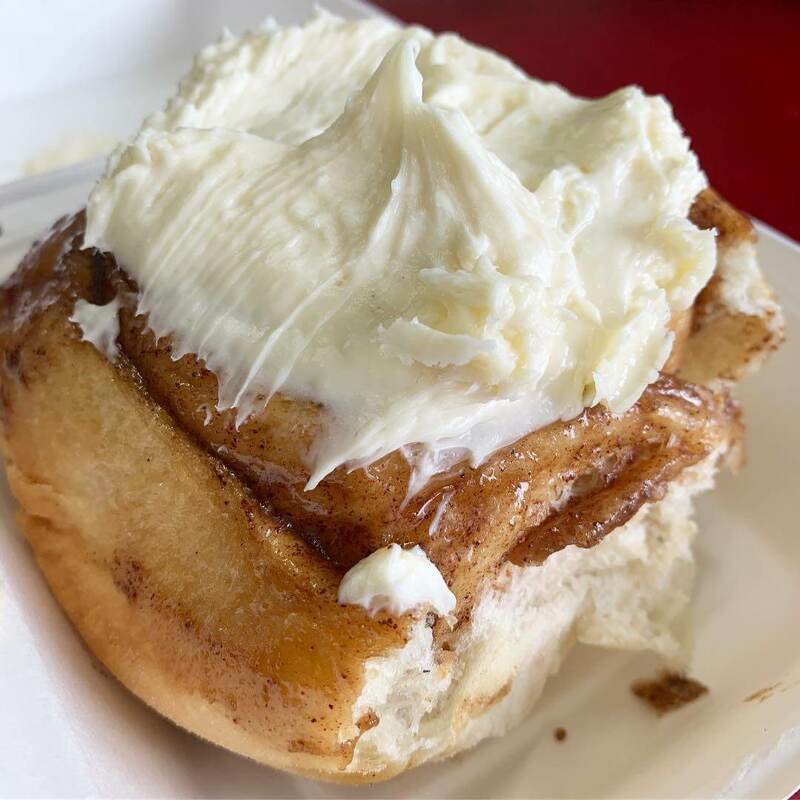 Definitely get it with cream cheese frosting. Tollers Bistro opened recently near the ZigZag as you come into town on Hwy 12. I’ve only been there a couple of times but I dream about their California BLT. They also have soups. I tried a spoon of Dewey’s and it was delicious. While they serve basically the same things as Eastside, their sandwiches are served warm so it is a bit different. Tollers Bistro is also open for dinner but we haven’t experienced it yet. 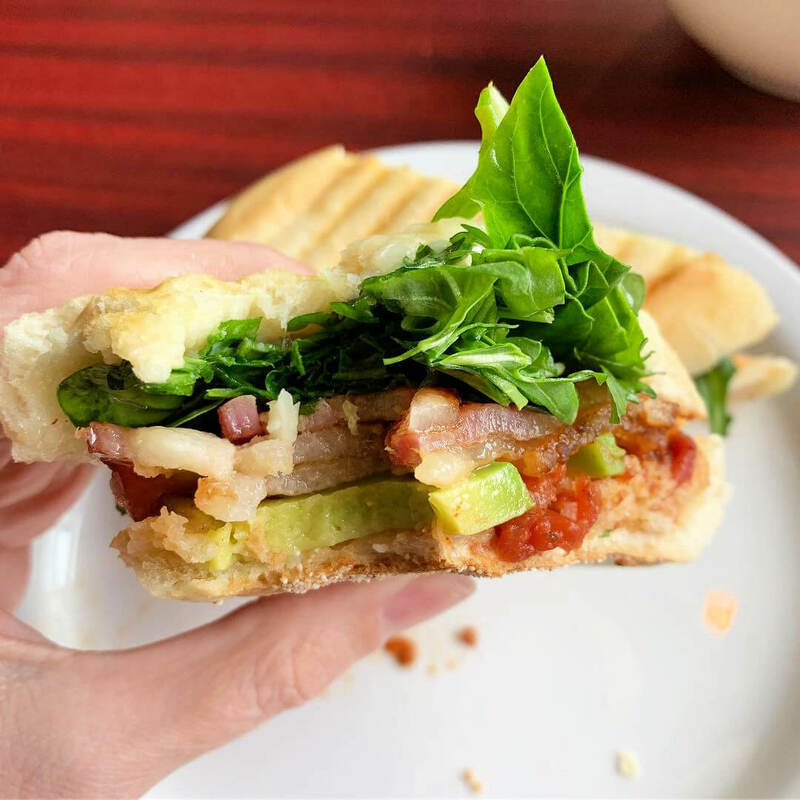 The California BLT comes with thick cut bacon, tomato jam, lettuce, cheese, and avocado. It is amazing. 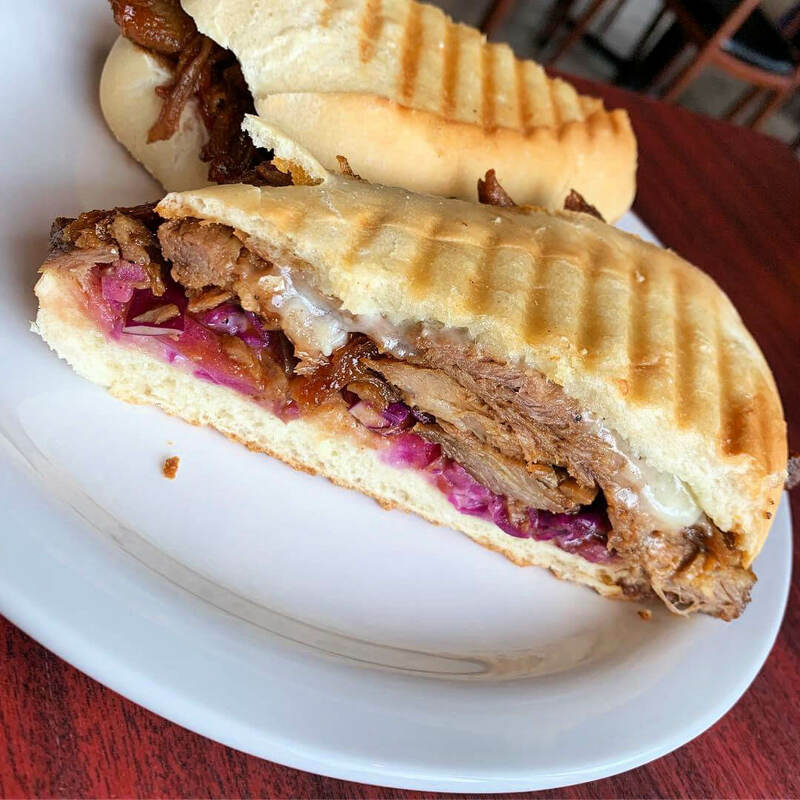 Pulled pork sandwich with red cabbage. Delicious and very filling. 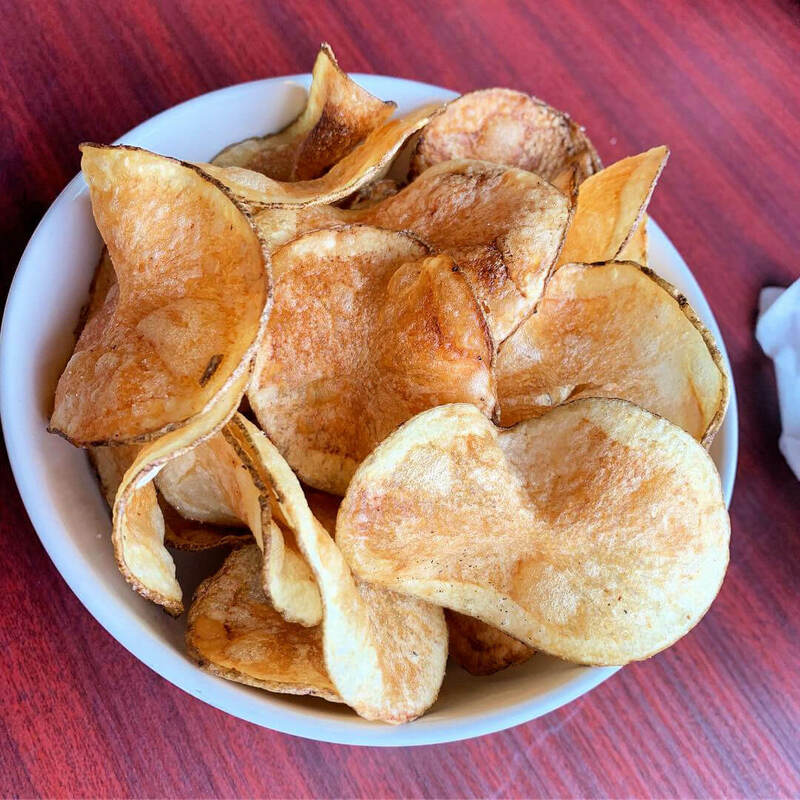 Their housemade chips are delicious, however, I find the serving too big if I am dining alone so bring a friend! 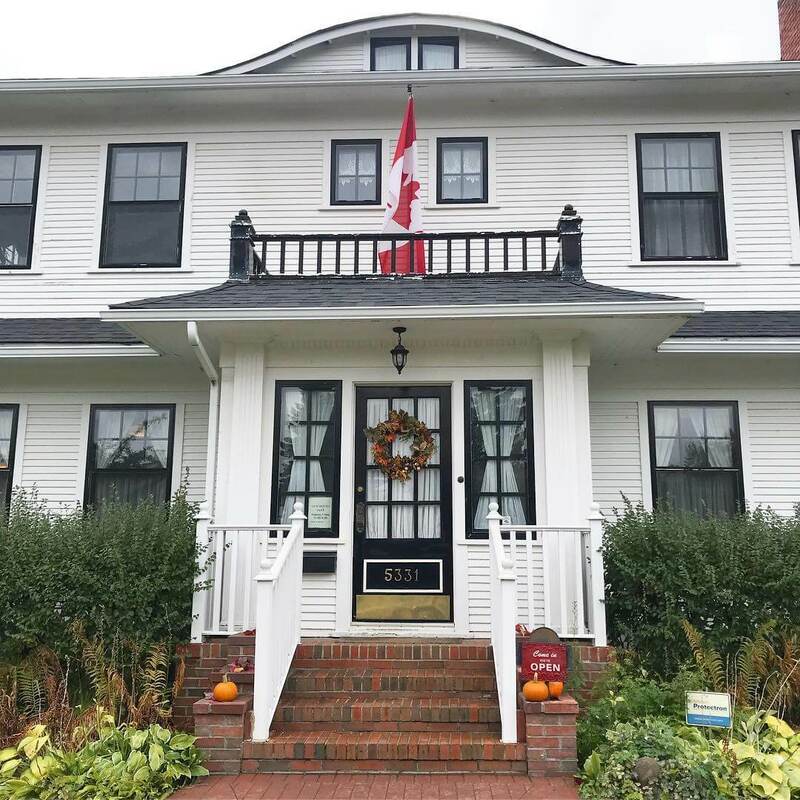 Morrison House Cafe is a gorgeous historic home in Lacombe that has been turned into a lunch-time restaurant. It is chock full of antiques and charm. It’s the perfect place to go out for a lunch with friends. In fact, I had lunch there with my friend Tina. I really wanted soup and sandwich but that isn’t really an option unless you order a full size of both. Instead, I convinced Tina that we should share. Perfect! Morrison House Cafe is open weekdays from 11 am – 3 pm. The Morrison House was built in 1919 by one of the town’s first mayors. It’s a gorgeous house! 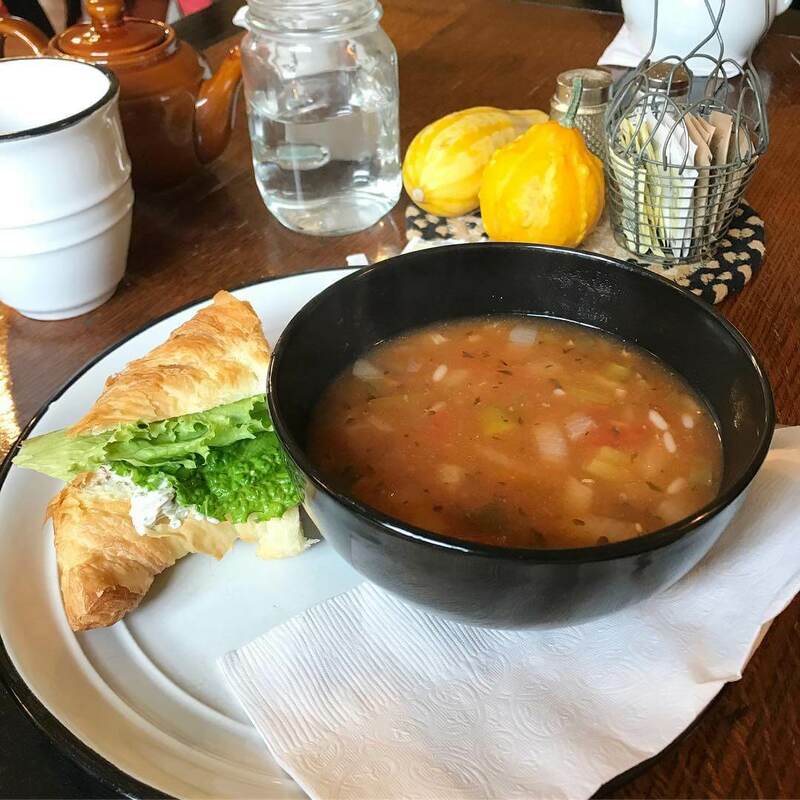 Soup and a shared chicken salad croissant. 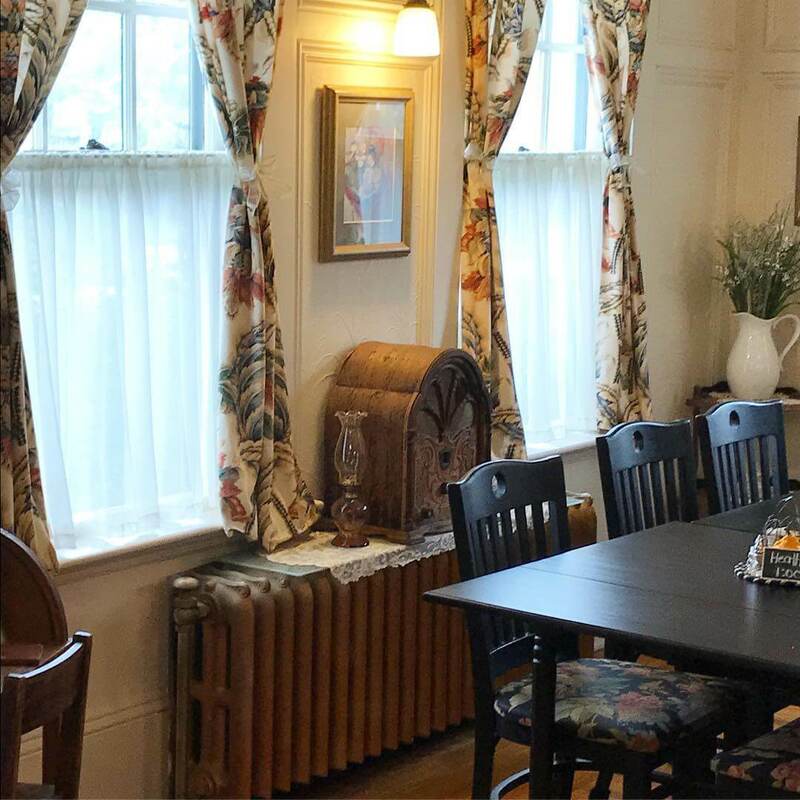 A delightful and warm space filled with antiques and charm. 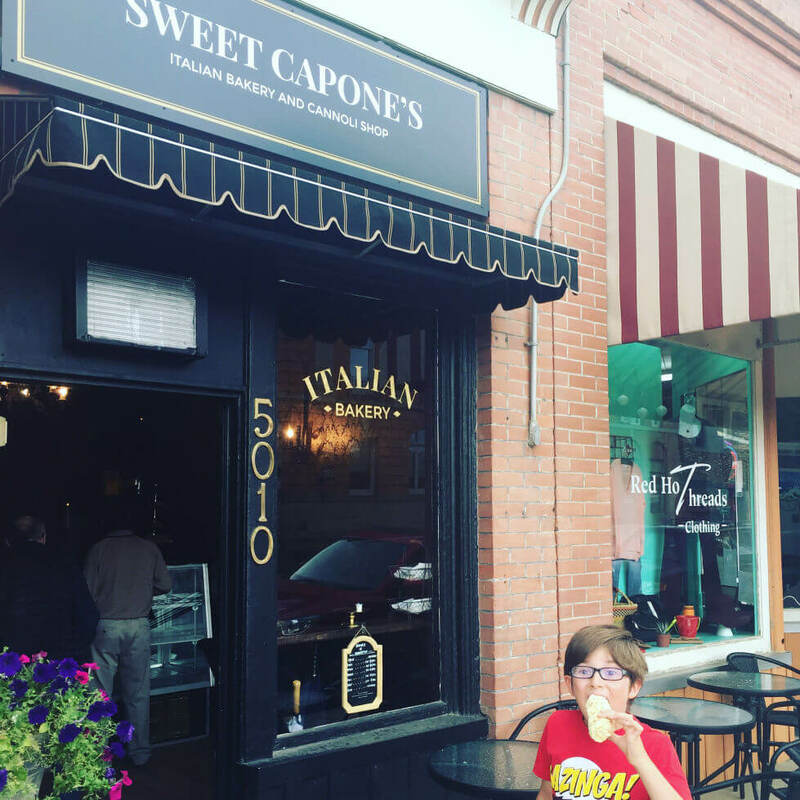 Sweet Capones is a dark and moody Italian cafe in downtown Lacombe reminiscent of days gone by. They serve delicious cannoli in a multitude of flavours, coffee, tea, espresso drinks, and lunch. I am ashamed to say that I’ve only had their cannoli. I can’t help it, it’s just that good! 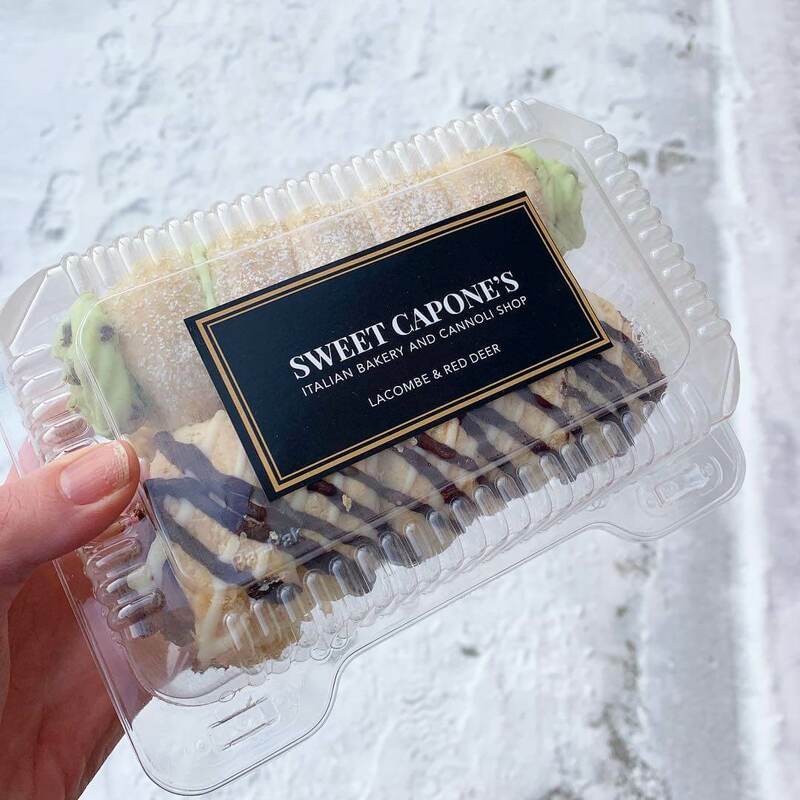 Who wants a sandwich when CANNOLI. You’ll want to follow their social media, though, because they also have live music and more. Oh, and if you are in Red Deer, they have a location there as well (tho it is locally owned by a lovely family very near me at the lake). A little treat for my boys. Four cannoli to share. We tried mint chocolate chip, double chocolate, orange creamsicle and cinnamon roll. Another of my favourites is coconut cream. It’s really hard to decide! So, those are my favourite Lacombe restaurants so far. I have tried a few others that I don’t LOVE so they won’t be featured here. Because if you can’t say anything nice….yeah. Are you hungry yet? 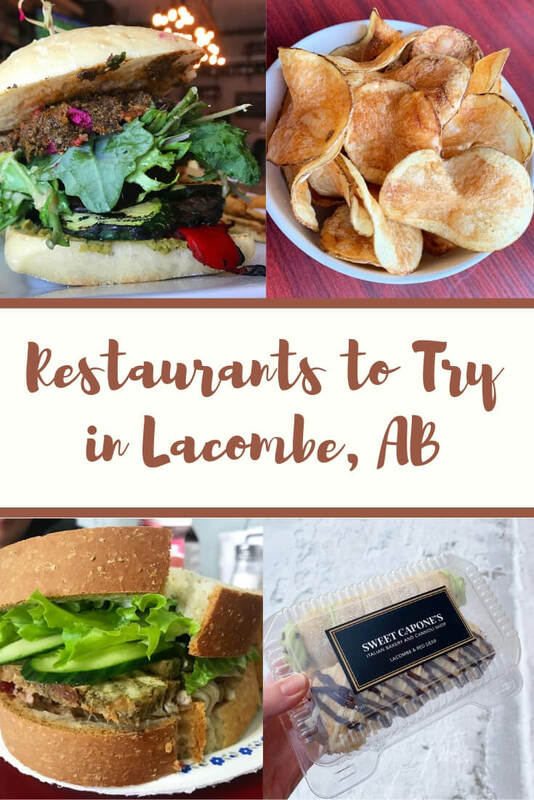 Next time you are headed north on Hwy 2, consider a stop off in Lacombe! If your visit is during the summer, may I suggest grabbing lunch and heading to Ellis Bird Farm! They also have a restaurant on site which has a new operator starting this year. Or check out more great ideas in my 16 Things to Do in Central Alberta This Summer post.